Akron and Macon were designed as airborne aircraft carriers, which could launch and recover heavier-than-air planes for use in both reconnaissance and self-defense. The ships were equipped with hangars, approximately 75′ long x 60′ wide x 16′ high, which could stow and service up to five aircraft in flight. 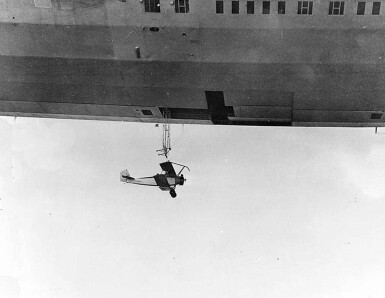 Aircraft were launched and retrieved by means of a trapeze, and could enter and exit the hangar though a large T-shaped opening at the bottom of the hull. The capacity to embark and deploy fixed-wing aircraft was the essential element of Akron and Macon’s ability to serve as naval scouts. Airplanes greatly increased the range and area over which the airship could search for the enemy, but also addressed the airship’s own inherent weakness; its vulnerability to attack. The giant airships made large, slow targets which were highly vulnerable to destruction by an enemy’s planes. Although the Navy originally envisioned the airships as scouting vessels which carried airplanes for fighter defense, over time (and over the objection of officers like Charles Rosendahl) the Navy eventually realized that the vulnerable airship itself was best employed in the background, out of sight of the enemy; the airship’s function would be to carry scouting planes within range of the enemy. As naval airship doctrine eventually developed, rather than the airplane extending the scouting range of the airship, it was the airship which extended the scouting range of the airplane. The Akron and Macon grew out of the Five Year Plan proposed by the U. S. Navy’s Bureau of Aeronautics, which had been approved by the United States Congress in 1926, and which authorized the construction of two large rigid airships. The Navy contest to design and build the two new ships was won by the Goodyear-Zeppelin Corporation, a joint venture and patent sharing arrangement between the Luftschiffbau Zeppelin and the Goodyear Tire and Rubber Corporation which had been created in 1923. (There was no serious competition for the contract, and it was clear to everyone involved in the process that Goodyear-Zeppelin was the only firm with the ability to design and construct these ships for the Navy.) 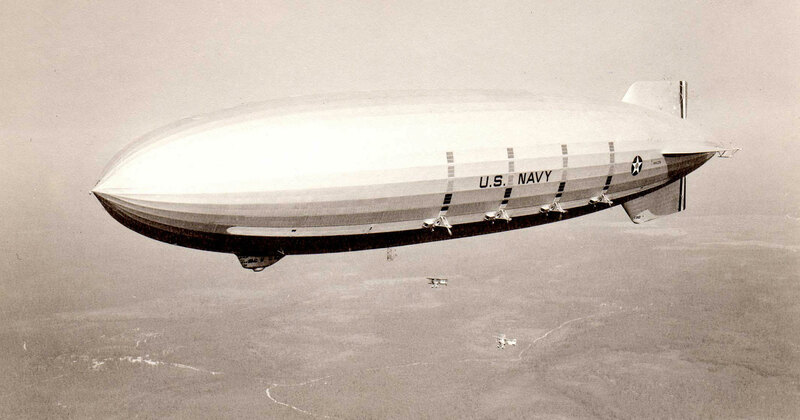 Goodyear-Zeppelin and the United States Navy signed a contract for the construction of two large rigid airships on October 16, 1928. 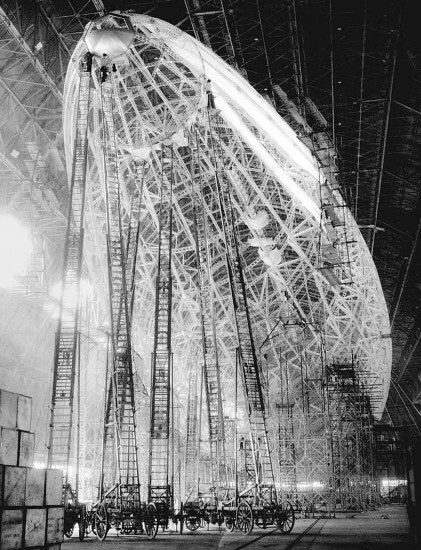 As part of the Goodyear-Zeppelin arrangement, the Luftshiffbau Zeppelin had sent technical experts to Akron to train Goodyear employees in the design and construction of airships. Goodyear president Paul Litchfield had insisted that the Zeppelin Company’s chief stress engineer, Karl Arnstein, be included in that group, and in November, 1924 Arnstein arrived in Akron along with a team of 12 hand-picked Zeppelin engineers. It was under Arnstein’s leadership that Goodyear-Zeppelin developed the plans which became the U.S.S. Akron and U.S.S. Macon. 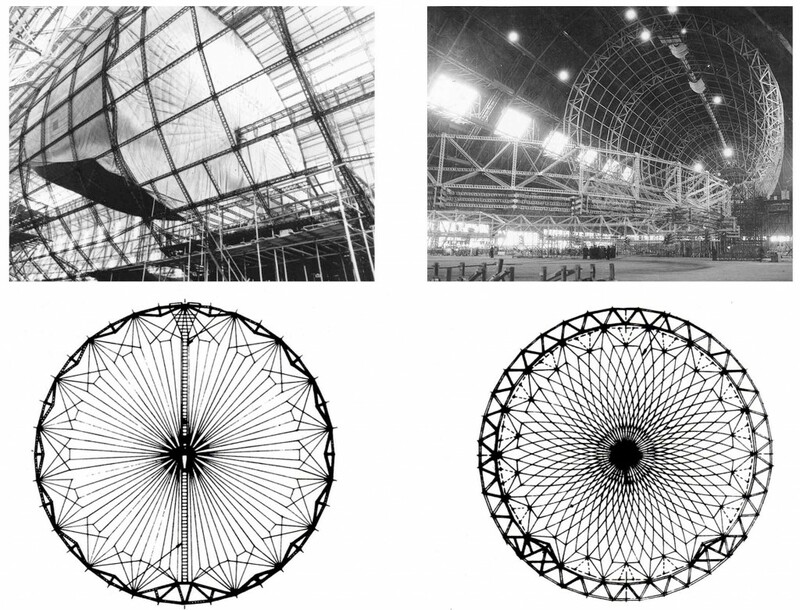 Arnstein’s design was radically different from the conventional zeppelin designs he had worked on at Friedrichshafen. No longer under the direction of the conservative Ludwig Dürr, the Zeppelin Company’s chief designer since the LZ-2 of 1906, Arnstein was free to develop new designs and techniques for Akron and Macon. 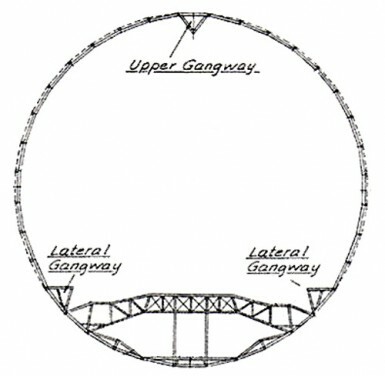 Traditional zeppelin design featured a series of main rings built of a single braced girder, which were generally spaced 15 meters apart with unbraced rings in between. Arnstein’s design for Akron and Macon utilized a series of “deep rings,” which which were large triangular structures — similar to the keel — spaced 22.5 meters apart. Arnstein’s deep-ring, three-keel structure was considerably heavier than the framework of a traditional German zeppelin, but it was also believed to provide greater structural strength, which was very appealing to a Navy which had just seen the U.S.S. Shenandoah crash after suffering in-flight structural failure during a storm. Structural design of Akron/Macon, from “The Story of the Airship” by Hugh Allen. The deep-ring design also accommodated a Navy requirement that all areas of the structure be accessible during flight; the 8-foot deep rings were large enough for a man to climb their entire circumference. Traditional zeppelin design was built around a single structural keel running the length of the ship along the bottom of the hull. Arnstein’s design was radically different, and featured three large triangular keels; one at the top of the ship, and two on either side at a 45 degree angle from the bottom of the hull. The main keel, at the top of the ship, provided access to the valves for the gas cells, and the two lower keels provided support for the engines and crew spaces. The three-keel arrangement, along wth the use of non-flammable helium, also allowed the engines to be carried internally, along the lower keels, rather than in external power cars; this significantly reduced aerodynamic drag and allowed for easier access and maintenance of the engines. The 560 hp Maybach VL-2 engines were connected to outrigger propellers by long shafts with bevel gears which allowed the propellers to be rotated to provide thrust not only forward and reverse, but also vertically downward to assist in takeoffs and landings. The mounting of the engines on the two lower keels did create one design element which was accepted only as a compromise; the four engines on either side were mounted in a straight line, and not staggered as the external power cars of earlier zeppelins had been. In earlier zeppelins, the staggering of engines at differing heights along the hull allowed each propeller to operate in clean air, undisturbed by the prop wash from the engine in front of it, whereas the propellers on Akron and Macon operated in the disturbed air created by the engines ahead of them. Placing the engines in a straight line along each of the lower keels, however, allowed for a much simpler and lighter design, and was accepted as a better alternative than the additional weight and complexity of the framework that would have been required to stagger them. Traditional German zeppelin design included a cruciform tail structure for strength, which Arnstein and his design team eliminated in the Akron and Macon. One other design element which would have great significance in light of later events was the shape and position of the stabilizing fins, which were modified from their original design to accommodate a Navy request that the lower fin be visible from the control car. Experience had taught airship commanders that the lower fin was vulnerable to damage in operations near the ground; Charles Rosendahl had been aboard the Graf Zeppelin during its difficult overweight takeoff from Los Angeles during its 1929 Round-the-World flight, when the lower fin, which had not been visible from the control gondola, only narrowly missed hitting power lines at the edge of the field. Both Rosendahl and zeppelin commander Hugo Eckener believed it was important for the officers to have an unobstructed view of the lower fin, and this requirement led to a modification of Arnstein’s original design which would later have tragic consequences in the crash of U.S.S. Macon. In the original design, the fins were to have been attached to the hull at three main rings: Ring 0 at the tail; Ring 17.5 at the center of the fin; and Ring 35 at the leading edge of the fin, which carried heavy loads. In order to make the lower fin visible from the control car, however, the design was changed to shorten the fins, and the modified fins were attached to only two main rings (numbers 0 and 17.5). The leading edge of the fins, which were subject to very heavy aerodynamic loads, were not firmly attached to any main, load-bearing structural element, but merely to weaker, intermediate framing. Given the in-flight structural failure of the tail section of U.S.S. Macon, there was considerable controversy regarding decision to eliminate the cruciform structure of German zeppelins, and even more controversy regarding the decision to move the leading edge of the fin so that it was no longer anchored to a main ring. One notable feature of Akron and Macon, easily visible in all photographs of the two ships, were the water recovery apparatus designed to recover water from engine exhaust to compensate for the weight of fuel burned during flight, to avoid the need to valve helium to maintain aerostatic equilibrium as fuel was burned. Construction of U.S.S. Akron began in November, 1929 at the newly completed Goodyear-Zeppelin Airdock in Akron, Ohio. The design of U.S.S. Akron, and its sister ship U.S.S. 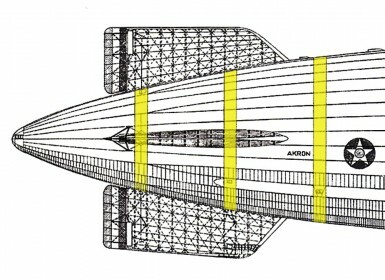 Macon, were based on plans prepared by Goodyear-Zeppelin engineer Karl Arnstein which differed radically from the design of previous rigid airships. The ship was christened by First Lady Lou Hoover, the wife of United States President Herbert Hoover, on August 8, 1931, and made its first flight on September 23, 1931, under the command of Charles Rosendahl. Rosendahl conducted a series of test flights over the next month, and then flew the new ship to the Naval Air Station at Lakehurst, New Jersey, where it was commissioned as a vessel in the United States Navy. U.S.S. Akron conducted its first naval exercise in January, 1932. While the ship’s range was impressive (it was able to stay aloft for several days and fly thousands of miles before returning to base), it performed poorly as a scouting aircraft, largely because it was not yet equipped with its squadron of fixed-wing aircraft, which would not become operational until the summer of 1932. On February 22, 1932, Akron suffered an embarrassing ground handling accident at Lakehurst, in front of a group of congressman waiting to board the ship for a demonstration flight, when the ship broke away from its handlers and smashed its lower fin into the ground. After two months of repairs, Akron spent most of the remainder of 1932 conducting trial flights, including operations with its fixed-wing squadron, and making goodwill and demonstration flights to show the airship to the American public and to congressional and other government VIPs. In one of its most impressive demonstration flights, in May and June of 1932, Akron made a cross-country flight from its base at Lakehurst to a new airship facility being constructed at Sunnyvale, California. It was during this cross-country flight, at a stop in Camp Kearny near San Diego, that Akron was involved in a tragic and very public accident on May 11, 1932. Three sailors on the ground crew were carried aloft by the ship’s mooring lines when the ship climbed unexpectedly, and two of the men fell to their deaths in an event that was captured on film and shown in newsreels throughout America. Akron participated in a very disappointing scouting exercise with the fleet off the west coast on June 1-4, 1932. Akron was able to locate the ships it was sent to discover, but still without its heavier-than-air squadron, Akron was required to stay close to the ships it was scouting, and seaplanes launched from those ships were easily able to score mock “kills” against the large, vulnerable airship. Akron’s squadron of F9C-2 Curtiss Sparrowhawk biplanes became operational in July, 1932, and the ship spent the remaining months of 1932 in training operations with its airplanes. During the first months of 1933, Akron continued to refine operations with its fixed-winged aircraft, and made several long distance flights including trips to Cuba and the Panama Canal Zone. Akron also made several shorter publicity-oriented flights, including an appearance at the inauguration of President Franklin Roosevelt on March 4, 1933. U.S.S. Akron departed NAS Lakehurst on the evening of April 3, 1933 on a mission to calibrate radio direction finding equipment along the northeastern coast of the United States. The ship was under the command of Frank C. McCord, and among the 76 persons on board were VIPs including Rear Admiral William Moffett, Chief of the Navy’s Bureau of Aeronautics, and Cmdr. 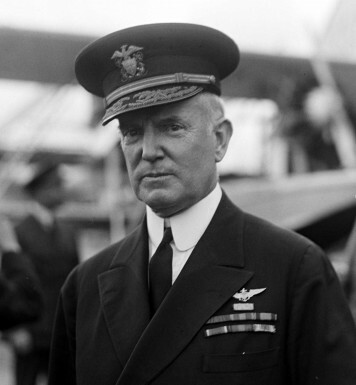 Frederick T. Berry, commanding officer of NAS Lakehurst. Shortly after midnight, in the early minutes of April 4, the ship was hit by a series of strong updrafts and downdrafts off the New Jersey coast. Akron rose and fell in the strong winds, and while attempting to climb, the ship’s tail struck the water. 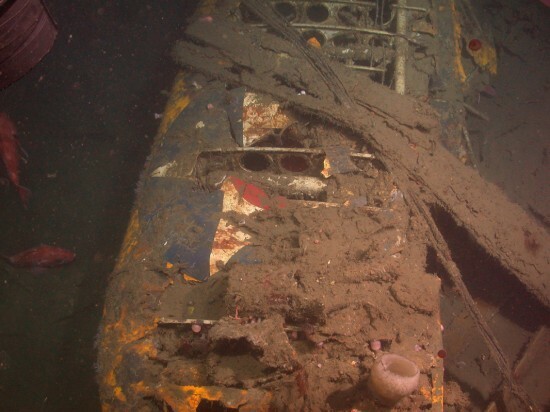 With its control surfaces destroyed, Akron was lost, and the ship crashed into the ocean. The cause of the crash is generally attributed to poor decisions on the part of the ship’s commander. It is likely that McCord relied on incorrect altitude readings given by the ship’s altimeter, which had been rendered inaccurate by the low pressure in the storm. Captain McCord may have thought his ship was higher than it really was, but as an aviator and aircraft commander, McCord should have been thoroughly familiar with the operation of a barometric altimeter and should have taken this into account. In addition, while it is possible that Akron was driven into the sea by a strong downdraft, it is equally possibly, and even likely, that McCord simply flew his ship’s tail into the water, having not taken into account the ship’s great length while attempting to climb out of a downdraft. With the nose of the ship raised sharply to climb, Akron’s tail, almost 800-feet farther back, may have simply been pivoted into the ocean as the result of poor handling. The crash of the Akron caused an appalling loss of life, and of the 76 persons on the ship only three survived; two sailors and the ship’s executive officer, Herbert Wiley. The rest of the ship’s passengers and crew died in the ocean from exposure to the frigid water, compounded by the lack of any lifejackets to keep survivors afloat. U.S.S. Macon (ZRS-5) was a virtually identical copy of her sister ship, U.S.S. Akron, with some minor modifications and improvements. The airship was christened by wife of Admiral William Moffett on March 11, 1933, and made its first flight on April 21, 1933. Later that year Macon left the Naval Air Station at Lakehurst for her new home in California at the U.S. Naval Air Station, Sunnyvale, which had been renamed Moffett Field in honor of Admiral Moffett. Macon participated in numerous exercises with the fleet over the Pacific and also the Caribbean. In one notable adventure, in July, 1934, Macon’s scout planes were able to locate the two Navy cruisers transporting President Roosevelt across the Pacific to Hawaii on vacation. Macon was generally successful in locating enemy warships during exercises but operations revealed that the airship had significant vulnerability to attack. In, April, 1934, in rough air over Texas, Macon’s tail was damaged in the area where the fins attached to the framework. In the original design of both Akron and Macon, the leading edge of the fins would have been attached to one of the ship’s main rings, but the design was modified to provide better visibility of the fins from the control car. The incident over Texas revealed the weakness in this design; repairs were clearly necessary, and were performed on three of the fins, but the Navy delayed repairs to the upper fin. Macon crashed at sea off the coast of California during a storm on February 12, 1935, after her unrepaired upper fin suffered in-flight structural failure. Unlike U.S.S. Akron, Macon was equipped with life jackets and rafts and all but two of the 83 officers and men were rescued from the ocean. I’m amazed by the quality of the outer cover on the Akron and Macon. The fabric looks just about perfect the way it fits and is finished. How did they develop the skills to do such a good application of such an enormous amount of fabric? John, my grandfather was one of the engineers who built the Akron. Please email me. Thanks! Seeing how these airships did so much of their exercises out at sea, I find it just appalling that it took the crash of the Akron to get the Macon equipped with life jackets and life rafts. Why didn’t anyone have the foresight to fit them in the first place?